Women returners: Back to your future: Kate's story - Returning to Engineering after a 7 year break. Kate's story - Returning to Engineering after a 7 year break. 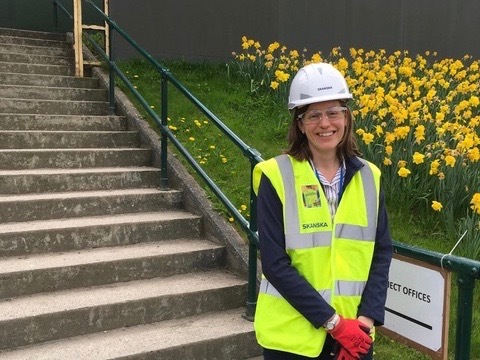 "To other professionals who are on a career break and want to get back into their chosen profession, my advice is not to give up"
Read Kate's inspiring story of returning to work as an engineer through the Skanksa 2016 Return to Work programme. I did a Master’s degree in Mechanical Engineering at Imperial College and joined a rail infrastructure company’s graduate training programme when I graduated. I worked for their rail vehicles section for six years in a range of roles, including as a project engineer managing the design and introduction of new rail vehicles into the UK infrastructure. During this time I became chartered with the Institution of Mechanical Engineers. After taking my maternity leave, my employer was unable to accommodate my flexible working request, so I decided to take a career break. Nearly seven years later, once my youngest child was about to start school, I attended a Women’s Engineering Society conference and heard Julianne speaking about Women Returners. I had started thinking about returning to work but was daunted by the prospect and wasn’t expecting it to be easy to find a suitable part-time role in engineering. A returnship sounded like an ideal way for me to get back to work, so I joined Women Returners and began scouring the monthly newsletter for suitable programmes. I joined the Skanska Return to Work programme as a Senior Engineer in SRW’s Engineering and Compliance team in November 2016 on a three-month contract, working part-time, and in January moved onto a permanent contract. The Women Returners coaching sessions were invaluable and provided useful, practical advice on re-joining the workforce as well as giving me the opportunity to meet the rest of my returnship cohort and share common experiences. At times it can be difficult juggling my job and my family commitments, but it’s not nearly as bad as I feared it might be before I started back at work. The coaching sessions with Women Returners were really useful in giving me tactics on how to deal with the added pressures of being a working parent, and it was great to have the advice and support of others who were having similar experiences at the same time. My new colleagues in Skanska were also very supportive, and helped me make a smooth transition back to work by being flexible both with work locations and with fitting my hours in around my home commitments. I have been on several training courses, some technical and specific to my role, and some more general to Skanska and the construction industry. To other professionals who are on a career break and want to get back into their chosen profession, my advice is not to give up. Organisations such as Women Returners are changing perceptions of career breaks and employers are starting to realise that there is a large pool of talent that they have been overlooking. Flexible working is also becoming more common for both men and women and does not need to hamper career progression. I am immensely enjoying being back at work and focussing on my career again. For a while during my career break I did not think I would be able to find a suitable role in engineering and considered retraining in a more “family friendly” profession such as teaching. I am so glad that I didn’t waste my training and qualifications, and I am thrilled to be back working in engineering.